Rome is a city like no other - You could spend months, even years there and not even scratch the surface of everything the city has to offer. Very few travellers however can afford to spend that much time in a city while on vacation. So if you've only got a week or two in the city, you're going to have to plan your trip wisely, right? When planning my Roma vacation I spent quite a bit of time mapping out where I was going, when I was going and buying all the appropriate tickets. While planning the itinerary, I made sure to add a few extra stops as 'possibilities' in case we ended up having extra time or if the weather wasn’t cooperating. On our last day in the city, I planned for a half-day excursion to the Roman neighbourhood of Trastevere which is just across the Tiber river and away from the main touristy areas of the city. Trastevere is known for its nightlife, fine dining and bustling atmosphere while also being a bit more laid back and less hectic than other parts of Rome. Admittedly, one of the main reasons I wanted to visit the area was to visit the restaurant “Roma Sparita” which was gained world-wide attention thanks to Anthony Bourdain’s praise for their unique take on Rome’s favourite pasta “Cacio e Pepe”. Unfortunately I wasn’t really paying attention to the time, nor the restaurant’s hours of operation and we missed out on lunch service while exploring the area. Instead we visited a random Trattoria in the area and had yet another amazing meal. I think every meal I had in Rome was amazing though. My original plan was to stick around Trastevere all afternoon and then head over to take some night photos of the historic Ponte Sisto bridge before heading back to our hotel. My girlfriend however had a better idea - Looking at the list of possible places to visit, she thought that time would be better spent checking out the Archbasilica of St. John Lateran. Oddly enough, the Archbasillica, which happens to be one of the most important cathedrals in the world as well as also the oldest public church in Rome only happens to be a minor tourist attraction compared to other destinations in the city. Which I'm sure you'll agree after reading this blog is a shame. 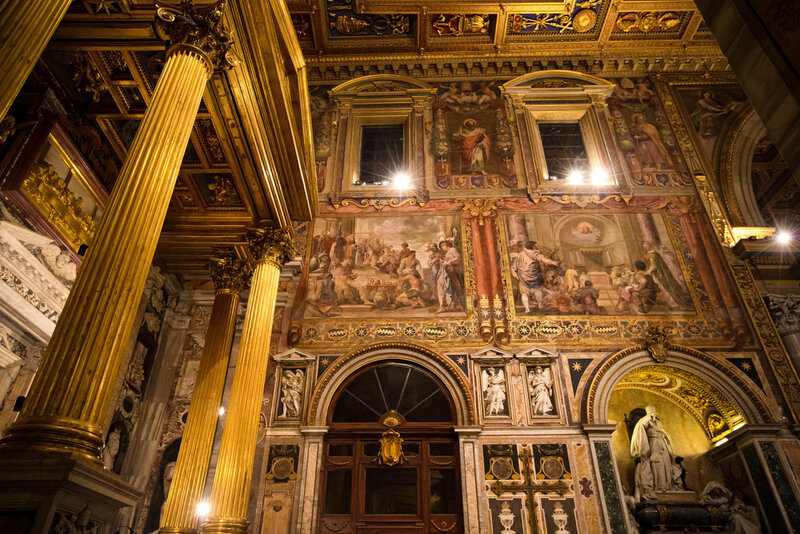 Dating back to the 4th Century, the Archbasilica of St. John Lateran is the oldest church in Rome and is also the highest ranking of the four papal basilicas. 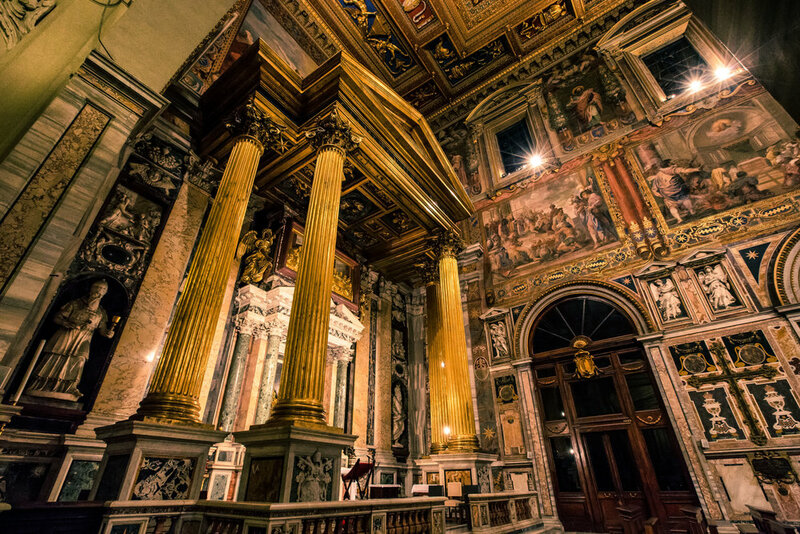 Home of the “cathedra” (throne) of the Roman Bishop, the church acts as the primary cathedral of the Catholic religion and you might be surprised to learn that it outranks St. Peter’s Basilica in the Vatican. 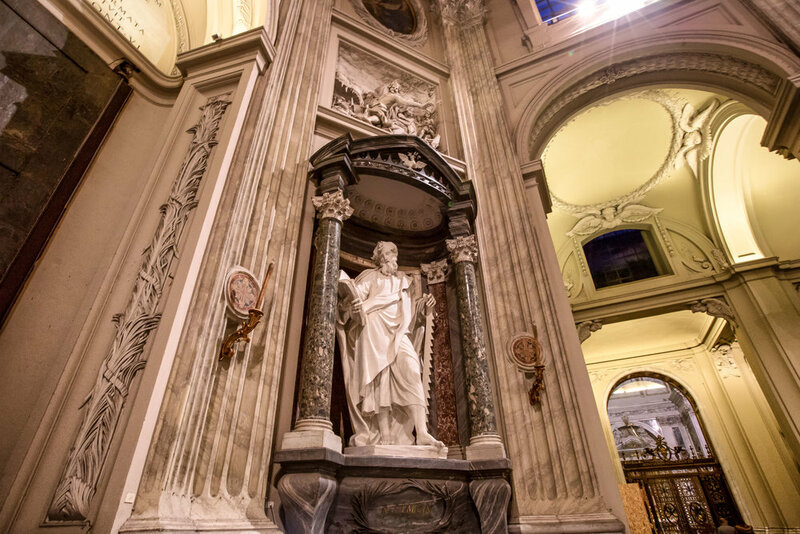 To put it a bit more simply: Due to a mixture of history and politics, the church is not currently home to the pope but is still owned by the Holy See but also shared with the people of Rome. Today it is considered the “mother church” of the Roman Catholic religion and even though the Pope rarely visits, it is still the most important of the four major catholic basilicas and oddly enough its administration falls to whomever is currently the President of the French Republic. I guess to sum things up easily we can just agree that when politics and religion get involved with each other, things can be a bit messy. The land where the archbasilica was constructed was once owned by a powerful family known as the "Laterani's" who were well-known for their service to the Roman Empire with members of the family serving under several different emperors. Unfortunately for the family, Plautius Lateranus, was accused by Emperor Nero (who was a bit insane) for conspiracy against the empire and all of their property, which included the Lateran Palace was confiscated by the state. Around the year 312, Emperor Constantine commissioned the construction of a basilica on a plot of land next to the Lateran palace and donated all of it to the Bishop of Rome with the intention of the palace becoming the home of the church and the clergy where they would live for more than a thousand years! Over that period of time the basilica has survived several fires and earthquakes and has had to be repaired and renovated on several occasions. Despite a thousand years of fixing leaks and scraping fire damage off the walls, the basilica today remains almost the same as it did when it was originally constructed. Two fires in the 1300s in particular though caused an extreme amount of damage to the basilica and the palace next door - The fires forced the popes, who at the time had already taken up residence in Avignon, France to make plans to move to the Vatican. If you are unaware of the events which forced the Popes out of Rome for most of the 14th Century, you might want to read about the “Avignon Papacy”, the “Western Schism” and the “Anti-Popes”. When the pope returned from France in 1377, Rome was a ghost town and most of the churches were in ruins. 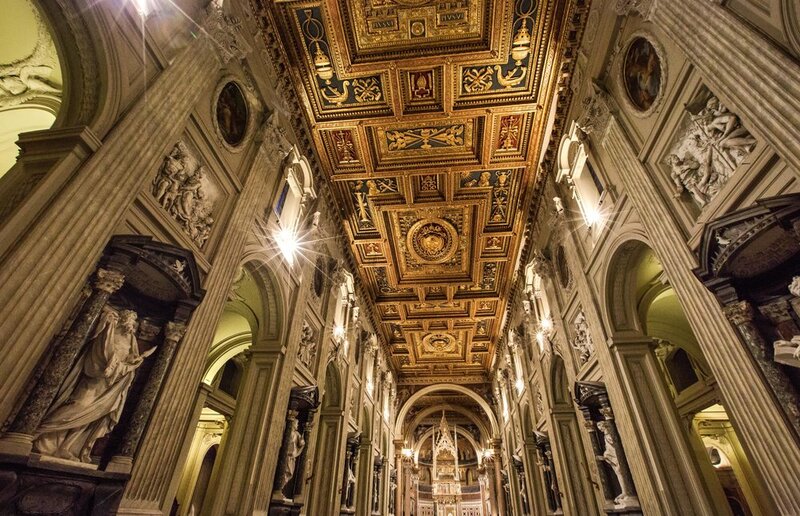 Pope Martin V and his successors started a process of restoration at the basilica which transformed the interior and remodelled the church into what we see today. 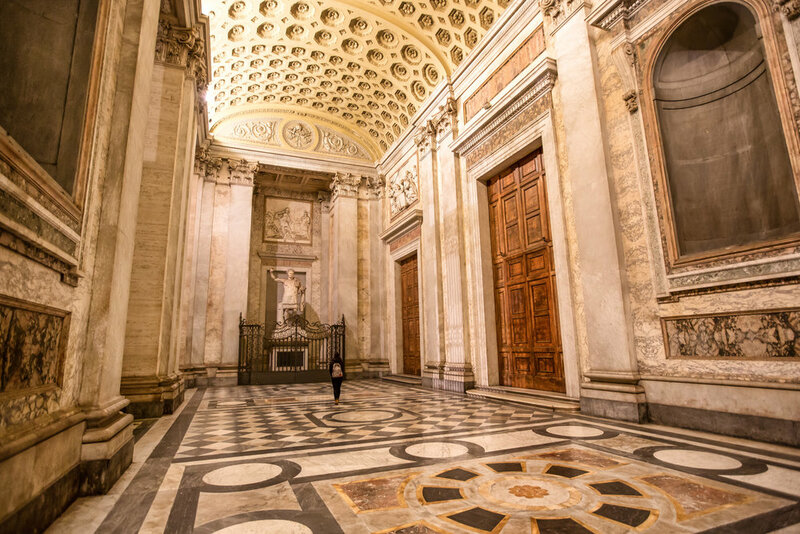 Seeing as how the leadership of the church was now living in the Vatican, they found alternate uses for the Latern Palace over the years which included a hospice for orphans, a museum for religious art and later as as storage space for overflow from the Vatican Museum Galleries. 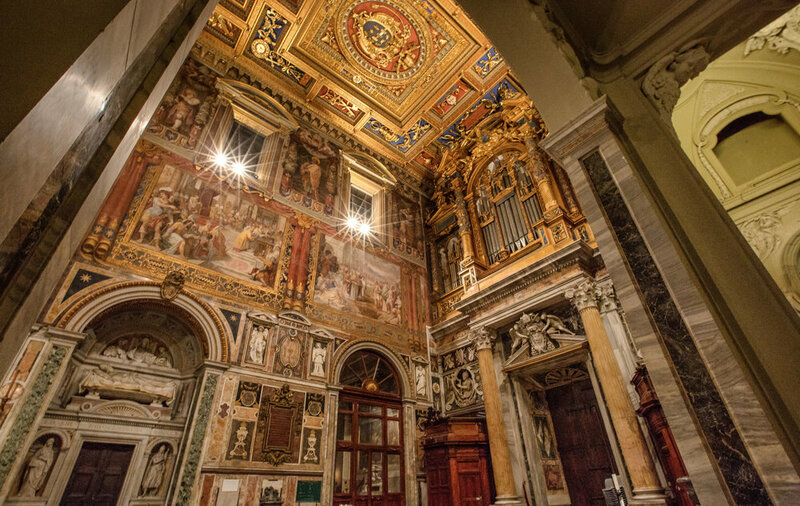 During the Second World War, the Lateran became a safe haven for Jewish refugees. Today the archbasilica continues to play an important ceremonial role within the Roman Catholic Church and also serves as both the Cathedral of Rome and a tourist destination making it a busy place all day and night. 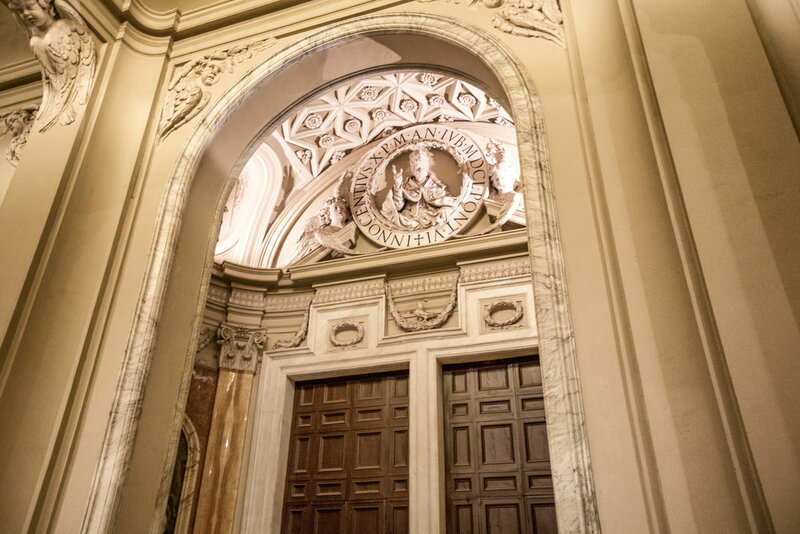 Visitors would do well to take notice of the giant bronze doors of the basilica which were previously used at Curia Julia (The Roman Senate) in the Roman Forum. You’ll also want to take notice of the statues, mosaics and frescoes which decorate the walls all over the church. You might also be interested in checking out the 'Altar of the Holy Sacrament' which contains a cedar table that is thought to have been the table used during the Last Supper. As I mentioned above, the Archbasilica of St. John Lateran isn’t as popular as some of Rome’s other tourist hot spots. I'm guessing the reason is because of its distance from the city centre. In truth, its only a 10-20 minute walk from Roma Termini Station, but for some tourists, that might be a bit too much. Personally, I found Rome much more enjoyable as a walking city, so I walked over from Trastevere and then walked back to my hotel. If you aren't interested in walking and want to get there quicker, the best way to do that is to take the Rome Metro to ‘San Giovanni’ Metro station. The basilica is more or less across the street. There is also a Hop On/Hop Off bus that will take you there, but it’s important to note that not all of the buses go that way, so you’re going to have to check at the bus stop to make sure which bus goes there. Entrance to the basilica is free of charge and is open to tourists everyday before six. It is also worth mentioning that before being admitted to the basilica you’re going to have to pass through a security check point. You may not want to bring too much with you when you visit in order to save time! Like a lot of tourists who visit Rome, I listed St. John Lateran as a “possibility” in case I had some extra time. In retrospect, I think that the it should have been much higher on my list of places to visit. It is a beautiful church that is full of history and is coincidentally the only church on my trip where I actually saw church-related things happening. If you’ve already finished visiting the Colosseum, the Vatican and Trevi Fountain, I recommend a stop at this beautiful basilica. The history and architecture on display at the Catholic Church’s most important basilica is something I think all tourists should enjoy.